Sitting on a sedan, the figure of Emperor Taizong is much larger than the ladies of the court surrounding him. Careful composition divides the picture, balancing the two groups of figures. Those on the right are a marshal dressed in a vivid red robe, Tibetan envoy Gar Tongtsen Yulsung and, on the far left, an interpreter. Unlike in the West, where historical painting was for a long period viewed as the highest form of the art, most ancient Chinese painters tended to focus on subjects such as flowers, trees, birds or landscapes to express their sensory experiences, individual personalities or deeply held values. The ink and color on silk handscroll is just under 130 centimeters by 39 centimeters and was painted by Yan Liben (circa AD 601-670), a painter and government official of the Tang Dynasty (AD 618-907). The multi-talented Yan was the imperial architect and served as the minister of public works in the imperial court. In fact, if Yan knew that most of us today remember him as one of the greatest painters in China’s history, he might not be too happy. For the artist often felt ashamed when people only mentioned his title of the imperial painter because at that time, painting was a pastime for scholars and officials and the status of the imperial painter was no better than that of a court servant. The envoy painting depicts the scene in AD 634 when Emperor Taizong (AD 598-649) of the Tang Dynasty received Gar Tongtsen Yulsung, a special envoy sent by Songtsan Gampo (AD 617-650), the ruler of Tibet. At that time, Songtsan Gampo had just unified former Tibetan kingdoms into the Tibetan Empire. Seeing that the Tang Dynasty was reaching an unprecedented level of prosperity, he decided to send a special envoy to see Emperor Taizong to present his proposal to marry one of the emperor’s daughters. Emperor Taizong accepted the proposal and decided to grant his daughter Princess Wencheng to the Tibetan ruler as his wife. The royal marriage played a significant role in enhancing relations between Tibet and the Tang Dynasty, as well as in Tibetan cultural and economic development in the following decades. “Bunian Tu” has not only recorded this important event, but also demonstrated the consummate painting skills of the official and painter, who used traditional fine line drawing technique to create vivid figures, and skillfully applied bright colors to evoke a festive atmosphere. Yan ingeniously generates a harmonious picture full of salient and subtle contrasts. Careful composition divides the left and right sides of the handscroll. On the right side are a cluster of 10 figures, the emperor and nine ladies of the court. On the left side, there are only three figures, standing slightly apart with the envoy in the middle. Sitting on a sedan, the figure of the emperor is much larger than the ladies of the court who surround him, some carrying the sedan and others holding two large ceremonial fans and a canopy. 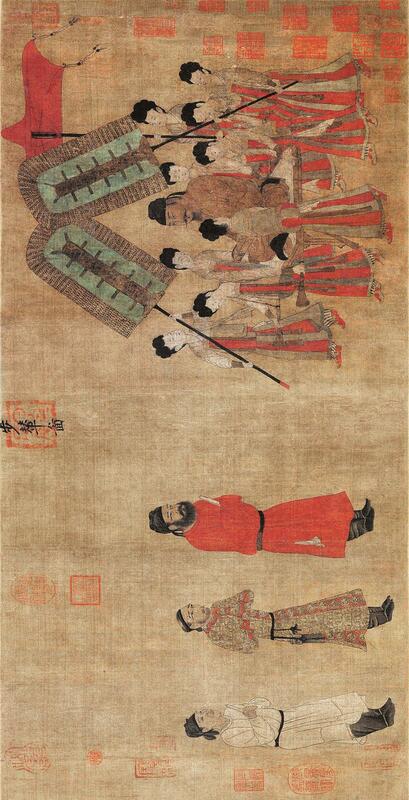 Emperor Taizong has a composed and kind expression, while the ladies of the court seem rather timid. On the left hand side, the figure closest to the emperor’s group is the marshal, who is wearing a bright red robe. Balancing that splash of color, on the right hand side the artist has painted the canopy and parts of the court ladies’ dresses red. Red is the color widely used in China for festive occasions. However, Chinese emperors usually didn’t wear red robes. Their designated color was golden yellow. 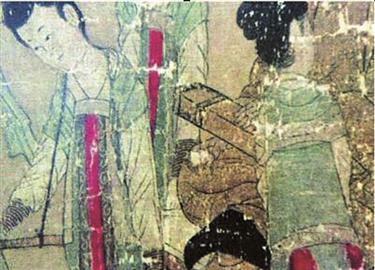 The emperor’s once-vivid robe in the painting has faded into stone yellow over the years. To help focus viewers’ attention on the figures in the foreground, the artist left the background largely blank. The painting, now in the collection of the Palace Museum in Beijing, is widely believed not to be Yan’s original, but a copy produced later. In 1978, the museum had the painting restored. But this has since triggered an outcry among art lovers as a white cloth bag, the right hand of the emperor and the hand of a court lady in the original were either incorrectly restored or removed altogether. In this 1959 reproduction of “Bunian Tu,” the emperor can clearly be seen to be holding a white cloth bag in his right hand. Yet these details disappeared following restoration work in 1978.